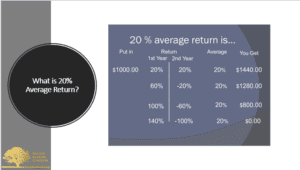 Another thing we want you to understand is what is an average rate of return? This one's going to surprise you a little bit. First of all, I want you to know that everything I'm going to show you is legal. A lot of the time you view money through a certain set of glasses and you think you understand what's going on. If I were to give $1,000 to an investment and say I got a 20% return on my first year and a 20% in my second year. That's an average 20%, and I would now have $1,440. When I say an average 20% rate of return, this is the big picture you have in your head. I'm going to end up with $440 more than I had before. 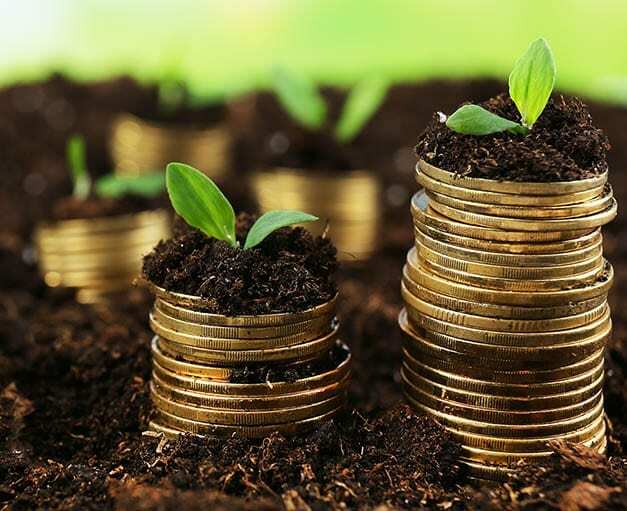 Another thing we want you to understand is what is an average rate of return? This one’s going to surprise you a little bit. First of all, I want you to know that everything I’m going to show you is legal. A lot of the time you view money through a certain set of glasses and you think you understand what’s going on. If I were to give $1,000 to an investment and say I got a 20% return on my first year and a 20% in my second year. That’s an average 20%, and I would now have $1,440. When I say an average 20% rate of return, this is the big picture you have in your head. I’m going to end up with $440 more than I had before. But the reality is that it’s acceptable to take that same $1,000, and get a 60% return this year but lose 20% the next year. And still honestly state that it’s a 20% rate of return, but only have $1,280. They’re both an average rate of return of 20%, but I only have 1,280 instead of 1,440. Well, that’s not so bad. Most people aren’t going to complain a whole lot or even ask too many questions. They were expecting $440 extra and they only have $280 extra, but at least they have extra dollars. It is also just as accurate to have doubled my money along the way and lose 60%. That’s still an average rate of return of 20%. I now only have $800 and I’ve lost $200 of my original money. It’s still acceptable for them to tell me that I’ve had a 20% average rate of return. If you want to get all the in-depth details of this, check out Tony Robbins book. He wrote one recently called Money, Master the Game. It’s very well written from a financial perspective. He talks about the rates of return that you’re being told you’re getting, but they probably aren’t what you’re actually getting. I have lost 100% of my money and I have zero left. See, when you’re getting a statement from your financial planners or from your funds, you need to do the math to find out what kind of return you’re getting. You can’t just take the numbers on there, because they’re allowed to do some things with those numbers that you would never expect. You expect those numbers to mean I’m making money. If I have a rate of return, how in the world can I have nothing left? But I’m telling you, it’s totally acceptable and legal for them to do that. It goes further. They’re allowed to deduct the expenses related to them managing my fund after they tell me I had a 20% rate of return. So again, I still don’t have an accurate amount on my return. According to my research, the average fees that are being paid by people are between 3.1% and 3.53%. Every dollar you put into the fund, somebody else is skimming off the top for their services, let’s say 3.5%. The lowest you’re going to find is about 1.5%. We had one person in class a few months ago find out what they were really paying. They went to their manager and said, “I want to know what my fees are costing and I want to know how much the percentages are.” And they said, “Well, we don’t give out that information.” And he said, “Aha, I was just in this meeting with Tim and Marcy and they said that you have to tell me by law.” Remember, I told you there are some changes coming. It took him a month before they turned over the information. But he found out he was paying 7.5% on his fund. Now understand, this is that compounding working against you. Say you give this man $100,000 and he’s going to manage your fund for you. He gets to take on average 3.5% out of that fund every year whether it made money or not. In the first year you have 100,000 and they get to take 3,500 of it. Let’s say they made you 10% that year and the next year you have $110,000. They now get to take 3.5% of $110,000. But let’s imagine that they made you no money the second year at all and you still only have $100,000. They get to take another $3,500. Totally acceptable. It’s what you signed on the dotted line to do. You just didn’t understand that’s the way it worked. When you take your money and put it in a 401k’s for 40 years, you’re signing up for the hope to have more money at the end. That’s the promise. But the reality is, the only thing you’re guaranteed is that somebody else is going to be taking off 1.5-3.5%. The only guarantee you get is that they’re going to get paid whether you make money or not. know if it is working for you or not. You can’t take the numbers at face value. Take the balance at one point and the actual money you could take out of it at two different points in time. Then calculate the difference and figure the percentage that way. It’s the only way you’re really going to know. You will not be able to know from the documents that you’re provided. Marcy and I ran into this. We started on a whole new journey about 10 years ago. We were working with some very reputable and honest people, but they kept telling us our average rates of return were 6-8% year after year. Unfortunately, we finally took ownership of our money and stopped trusting what other people said. We looked at the numbers and there wasn’t any more money there. There wasn’t any significant amount of money to justify having that money there for 10 years. And when we did the math, we found out that our net growth hadn’t even been 3.5% over the whole 10 years. Even though we had been being told we were making 6% to 8% year after year. They get paid even when you lose 100%. Once it’s down to zero, they don’t get paid anymore and they’ll tell you when you ask them, it’s like what’s my incentive? The more money you have, the more percentage I get. That’s my incentive, but they’re not incentivized in the same way you are. If you lose, yeah, they’re out 3.5% of that next year, but you’re out 100% of it forever. Just understand that’s the way that it works.